When I happened upon a quote one day many months back, I realized I had to know more about the man, Antione de Saint-Exupery, who had penned it. My research revealed that he was a rather amazing guy. This French author, pilot, journalist and aristocrat was born in 1900 and died forty-four years later when the plane he was flying on a reconnaissance mission for the Free French Air Force was shot down over the Mediterranean. My research also noted that Saint-Expery wrote a lot of things that people love to quote. His most famous work was The Little Prince and, taken together, his writings have been translated into over 250 languages and dialects. This long-dead Frenchman, without having a clue he would do it, had reached into my soul with words that put much of what I believe about life into a concise package of thirty-five words. I kept mulling over what he wrote and, eventually, decided I needed to put his words into print. I had to share his philosophy because it was my philosophy. I wanted to use a broadside as the vehicle to explain to others why being free is such a mystically wonderful experience, why being free allows the creative energies of people to flower as nothing else can. Being free is critical to living a robust life that permits people to explore experiences and challenges. In short, being free permits us to live. I am not talented at designing, so I asked my son Nick to work with me on the project. He created the design and I turned it into a letterpress broadside. You can see the Saint-Exupery broadside here. Whenever I glance up at it, Saint-Exupery’s words serve to remind me that the secret of people being creative rests in letting people discover what fascinates them and then get out of their way. Check out for yourself the man and his wonderful quotes. I think they will inspire. 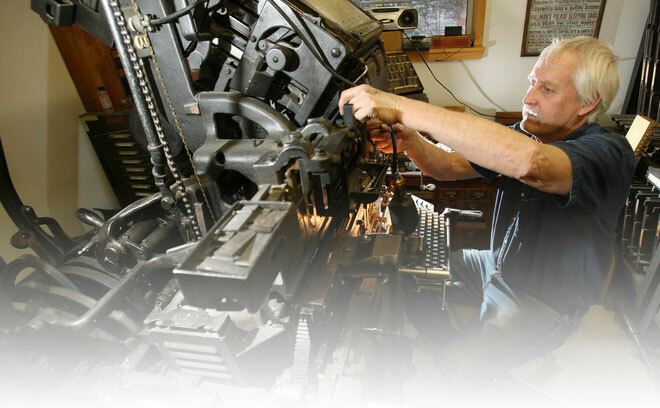 I am a letterpress printer, a hot metal typesetter, a hand bookbinder, a hand paper maker and paper marbeler. I publish books, pamphlets and broadsides and do commissioned book typesetting and printing as well as general commercial printing. Too many letterpress printers want to take your first child in ransom for working with you. Mind you, some first children might be good to be rid of, but you get the idea. Anyhow, I think letterpress ought to be available to the non-Donald Trumps of this world and I am devoted to making it possible for those of us with considerably lesser means to enjoy the thrill of having our books or pamphlets printed letterpress. That's about it. I look forward to working with you. Thanks for your note. I will post one today or tomorrow. Don’t know for sure when I can get to the Post Office. Just send payment when you can. Hope you will enjoy it as much as I did working on it. 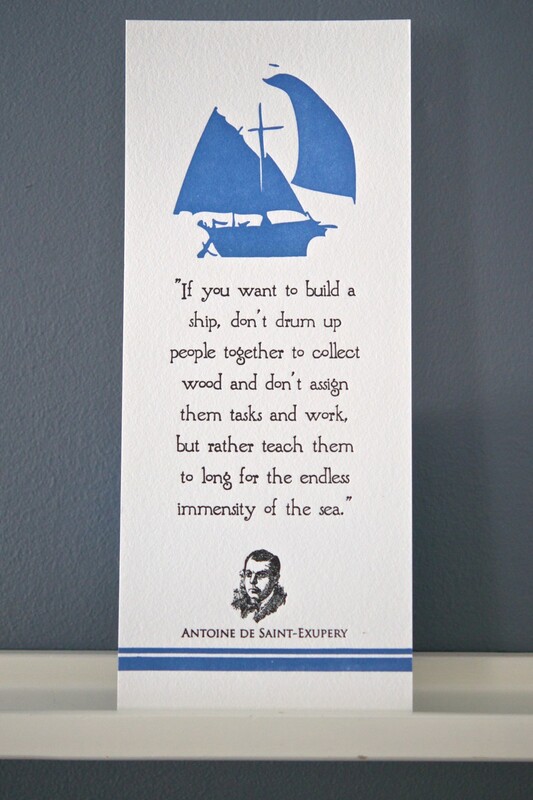 If you get a chance, check out other quotes from Saint-Exupery.